Hard Rock, Proto-metal, Proto-Doom, Stoner Rock & Heavy Prog/Psych obscurities of the 60s and 70s. 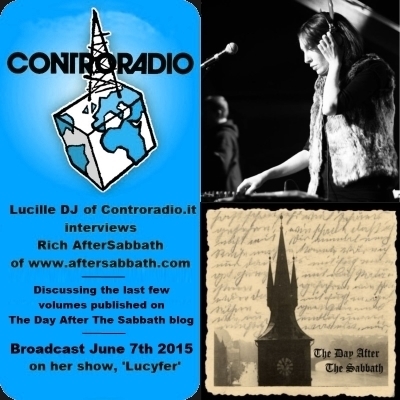 Many thanks to Lucille DJ (fb) at www.controradio.it (web) for getting in touch again and asking to conduct a second interview, which was broadcast on the 7th of June 2015, on her weekly radio show 'Lucyfer', based in Florence Italy. We discuss volumes 117 & 118, and the interview with Jim Smith of Stonehouse, while Lucille plays many tracks from artists such as Malo, Yaqui, Ultimate Spinach, Beacon Street Union, Quill and Stonehouse. You can hear 'Lucyfer' by Lucille DJ every Sunday from 9pm to 10.30pm C.E.T. streaming at www.controradio.it, where it is also available as a podcast download. 14:20 Rich - Volume 117: Bosstown Sound contd. 21:25 Rich - Volume 117: Bosstown Sound contd. 32:30 Rich - Stonehouse contd. 38:45 Lucille - Thanks & Goodbye! For web expenses and continuing searches... Thanks! Unzip problem? Make sure you enter the password, and for MAC users especially, I recommend using the free, opensource program 7Zip (there is a MAC version too), which is what I make the zips with. Feel free to contact me, or report dead/erroneous links, at: aftersabbath@live.co.uk If you have trouble with any volumes in particular email me and I'll sort out alternative methods. Head Guide: ANTEQUERA BACK IN STOCK!